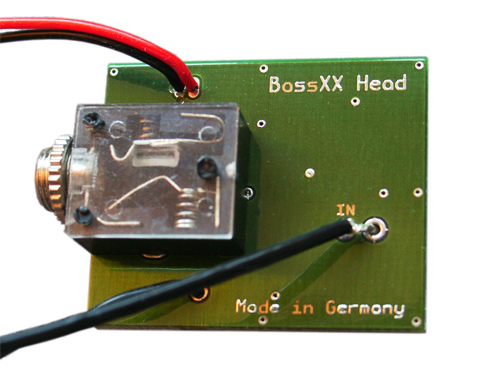 This is a small headphone amp designed for internal installation in your instrument. Perfect for all those,who (still) exercise and want to use headphones. The components are the same high quality parts as on the BassXX preamp, resulting in a clear, full range output. It can be powered by either a separate or the same 9V battery as your active preamp and is pretty easy to install. The most difficult part is drilling the hole for the extra output jack. The wires are + and - 9V (12V max.) for power and the shielded signal-in from the pickups or active electronics. The last one is a self-switching ground, with which you can automatically turn on your additional active tone-control, once the headphone jack is inserted. Also, the preamp automatically turns on and off, once the headphones are plugged in or removed. We recommend using headphones with an impedance of approx. 32Ohm, like the Sennheiser PMX-60. Of course ither impedances will also work, but result in different volumes. Dimensions: 29.5mm x 24.4mm x 4.0mm. The user manual can soon be found here.